Summary: A new study in JCB reveals the mechanisms behind anastasis, a process that allows cells to recover from the brink of programmed cell death. A new collaboration between two UC Santa Barbara labs explores the underlying molecular mechanism of a remarkable process called anastasis, a Greek word meaning “rising to life.” Building on earlier work showing that cells can recover from the brink of death, the new study demonstrates that anastasis is an active process composed of two distinguishable stages. The team’s findings appear in the Journal of Cell Biology. First, the biologists added a toxin to the growth medium to induce apoptosis — a form of programmed cell suicide that is an integral part of almost every disease — and took the cells to brink of death. Then they exchanged the medium to remove the inducer and allowed the cells to recover for one, two, three, four, eight or 12 hours. At every step along the way, the researchers collected millions of cells and sequenced their RNAs to discover how their genetic profile changed during this process. Montell’s lab worked with UCSB’s Kosik Molecular and Cellular Neurobiology Lab, which conducted the RNA analysis. The data from the RNA profiles not only demonstrated the active nature of the anastasis process but also showed its two distinct phases. During the first four hours, the cells undergo massive changes in gene expression compared to untreated cells. Yet cells one hour into recovery are much more similar to each other than they are to cells at eight hours, which look similar to those at the 12-hour mark. The team focused on one particular pro-survival RNA called snail that is enriched at the brink of death. The cells don’t make protein out of the RNA or degrade it; rather, they hold on to it. When the scientists prevented the expression of snail, the cells were unable to survive. They also discovered that RNAs induced in the early phase of anastasis promote transcription of other genes, which allows cells to recover and start dividing. In the later phase, RNAs change what they make and acquire the ability to migrate. “Some things are expressed during the whole recovery process, including angiogenesis inducers that make new blood vessels,” Montell noted. “This looks a lot like wound healing: cell proliferation or migration to fill in the gap and the creation of new blood vessels to nourish the recovery. 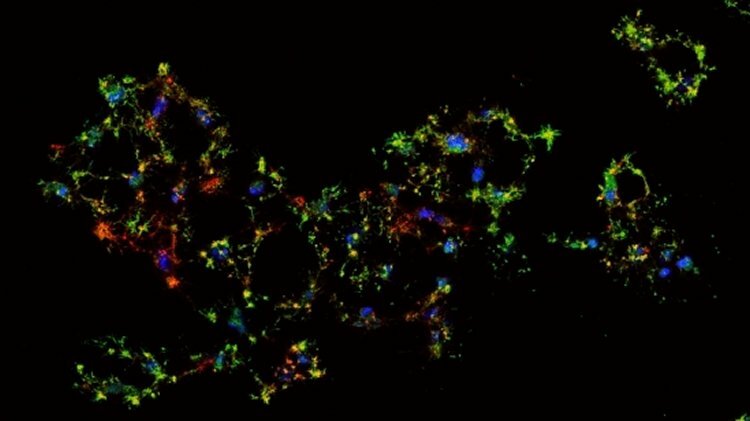 Dying human cancer cells are labeled with fluorescent dyes to show DNA (blue), actin (red) and active caspase 3 (green).. NeuroscienceNews.com image is credited to the researchers. Now that the researchers have described this molecular mechanism, they are particularly interested in the earliest phases of recovery before cells begin transcribing new genes. They also would like to better understand the long-term cellular effects of anastasis. Image Source: NeuroscienceNews.com image is credited to the researchers. UC Santa Barbara “Back From the Brink: How Cells Recover From the Verge of Programmed Death.” NeuroscienceNews. NeuroscienceNews, 27 September 2017. UC Santa Barbara “Back From the Brink: How Cells Recover From the Verge of Programmed Death.” http://neurosciencenews.com/anastasis-genetics-7602/ (accessed September 27, 2017). During apoptosis, executioner caspase activity has been considered a point of no return. However, recent studies show that cells can survive caspase activation following transient apoptotic stimuli, a process called anastasis. To identify a molecular signature, we performed whole-transcriptome RNA sequencing of untreated, apoptotic, and recovering HeLa cells. We found that anastasis is an active, two-stage program. During the early stage, cells transition from growth-arrested to growing. In the late stage, HeLa cells change from proliferating to migratory. Recovering cells also exhibited prolonged elevation of proangiogenic factors. Strikingly, some early-recovery mRNAs, including Snail, were elevated first during apoptosis, implying that dying cells poise to recover, even while under apoptotic stress. Snail was also required for recovery. This study reveals similarities in the anastasis genes, pathways, and cell behaviors to those activated in wound healing and identifies a repertoire of potential targets for therapeutic manipulation.